What are the potential risks involved? Procedures which can be used in addition to, or instead of surgery to reduce the appearance of wrinkles. Anti wrinkle injections such as Botulinum toxin, can be used in addition to, or instead of surgery to reduce the appearance of wrinkles particularly between the eyebrows, the crows feet, the wrinkles at the side of the nose and wrinkles outside of the eyes. It works by causing a temporarily paralysis of some of the muscles that are associated with smiling. As a result anti wrinkle injections temporarily paralyses the muscles causing lines which are produced with facial movement and may go some way to minimising the production of lines which are permanent and not related to movement. The use of fillers will help to improve contour and fill areas of depression and wrinkles. The injections can be either autologous (eg. a patients own fat) or artificial. When using artificial materials these agents attract water (hydrophilic). These agents are temporary and classically will last nine to twelve months before needing replacement. It is common for a temporary artificial filling agent to be used initially and if the patient likes the result that is achieved, then a more permanent solution (eg. using a patients own fat) can be done at a second stage. The artificial agents are usually composed of hyaluronic acid. This is a safe and predictable product with reliably reproducible results. This agent can also be reversed and removed completely if required. Please note that the Therapeutic Goods Administration prevents us from using product names or ingredient names on our website. 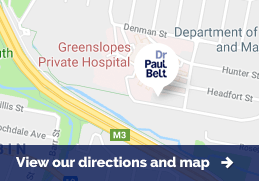 Dr. Belt will be pleased to discuss specific products at the time of consultation. Please contact Dr Belt's staff on 07-3852 6800 and a personalised quote and further information will be provided. Very rarely a patient may have an unknown allergic reaction to anti wrinkle injections. Occasionally the anti wrinkle injections may spread beyond the target area and this may result in the weakness of muscles beyond the intended area. This may result in some drooping of the eyelids. This can be counteracted with some medications but generally if left alone it will subside within 2-3 weeks. Occasionally some patients may experience bruising and swelling but this will only take a week or two to subside and can be reduced by using ice packs. The effects of anti wrinkle injections are not immediate and will vary from patient to patient. It is worth waiting five days for the paralysis of the muscles to occur and subsequently for the wrinkles to diminish. Any bruising can be helped with cold packs for a period of up to 48 hours. Cold packs are used to numb the area prior to the anti wrinkle injections, and minimise superficial bruising following the injections.